Canadian educators have partnered with the National Skill Development Corporation of India to undertake part of the mammoth task of upskilling India’s youth population. With the NSDC responsible for training 150 million young people by 2022, this month it has signed 13 memoranda of understanding. The MoUs, 12 of which with Canadian colleges as well as an umbrella MoU with Colleges and Institutes Canada, will facilitate collaborations for skill development in a variety of different sectors, including water, aviation and hydrocarbon. The agreements were endorsed by both Canadian Prime Minister Stephen Harper and Indian Prime Minister Narendra Modi during the latter’s visit to Canada last week, the first in 42 years. In 2009, under the National Policy on Skill Development in India, a target to train 500 million people before 2022 was set and the NSDC has been charged with training 150 million. Cynthia Murphy, director of the Canadian Immigrant Integration Programme at Colleges and Institutes Canada, told The PIE News that with the looming deadline, development under these MoUs is moving very quickly. “We all know of MoUs that are signed that don’t have a lot of activity – that’s not happening with this group,” she said. According to CIC figures, last year Canadian colleges and institutes hosted more than 8,000 Indian students– more than the number at universities, language schools, primary and secondary schools combined. Education in general was one of the key areas that both Prime Ministers agreed to prioritise for bilateral engagement. Canada also listed India as one of the priority countries to work with in its international education strategy last year. Modi’s visit followed trips to Germany and France where he signed a two-year residence permit for Indian graduates with French president Francois Holland. Murphy said that while on this trip Modi connected with the diaspora, but also with business and industry. Despite the initial momentum of the collaborations, Husain Neemuchwala, CEO of the Canada-India Education Council said Modi has a lot to prove in the face of India’s upskilling needs. Learn about BC’s new education quality assurance standards (EQA) and examine the confluence of ‘business’ with education. How do we measure ‘ROI’? BC is committed to increasing international students by 50% by 2016. Source: Nitya Rajan of PIE News | A new ordinance from India could help foreign universities set up branch campuses as non-profit companies and issue government recognised foreign degrees for the first time – without any form of partnerships between itself and a local higher education institution (HEI) . The announcement from India’s human resource development ministry (HRD) came over a month ago and still has a few more hurdles to jump before it becomes law. If it clears however, HEIs worldwide will have easier access to India’s 1.2 billion population– 50% of who are aged 25-years old and under. “It could change mobility out of India but it is still early days and we don’t know when the laws will be set in stone,” John Bunter, Trade and Investment Adviser at British Deputy High Commission told The PIE News. However, the Indian government is being seen to make every effort to welcome foreign universities, including reducing the deposit necessary to establish a campus from $ 8,125,000 to $4,062,500. The new legislation also stipulates that universities be listed as one of the world’s top 400 and parent branches will not be entitled to distribute profit from their Indian campuses to overseas parent branches or repatriate money. “The proposal is a positive thing. The biggest change is that degrees will be recognised as foreign degrees and it has been approved by the Indian government,” Amanda Selvaratnam, Director of The Training Gateway – a company brokering educational partnerships between UK training providers and global organisations – told The PIE News. “A lot of universities are still happy to do the partnership approach. We had a delegation of eight universities from Pune who are meeting 18 British universities this week,” she said. “Those within the UK who may be interested in launching campuses have kept their cards close to their chests,” she added. Others, however, including US universities Duke University, California Institute of Technology (Caltech) and VirginiaTech have been more vocal about the chance to capitalise on India’s booming student market. “While Virginia Tech plans to establish research centres and graduate education programmes in India, we are waiting for the government of India to outline the final rules and regulations for the establishment of foreign universities in India,” Guru Ghosh, the vice-president for outreach and international affairs at Virginia Tech told The PIE News. “In the meantime, we are moving forward with establishing a research centre outside Chennai in 2014,” he said. Still, some industry experts say the ordinance’s small print could put HEIs off. In Canada, where some 12,049 student from India studied in Canada in 2011 , educators are pausing for thought before taking India’s bait. “It’s positive in general but not a whole lot of Canadian institutions qualify for the top 400 requirement, right now there are some schools that would tick all those boxes,” Husain F. Neemuchwala, Chief Executive Officer of Canada India Education Council (CIEC) told The PIE News. “I have guarded optimism about the proposal, because it’s not easy to acquire land and the repatriation will also cause issues,” Neemuchwala added. With 47 million people expected to be in the working age group by 2020 and India only spending 3.7% of its GDP on education, the government is hoping its open arms to foreign educators will meet the rising demand for quality education. Local education in India has come under criticism for leaving its graduates poorly prepared for work – none of its institutions list in QS’s 2013/14 rankings. The City of Toronto is partnering with academic institutions and the Ontario Ministry of Training, Colleges and Universities to enhance the positive experiences of international students who come here to study and live. To kick off this annual initiative, from August 15th to September 8th, the City of Toronto hosted its Airport Welcome Program for all International students newly arriving at TorontoPearsonInternationalAirport, providing them with all the information they needed to get settled in their new home. The City is now preparing to celebrate those International Students who have chosen Toronto as their academic hub with its 2nd annual Toronto International Students Festival. With over 59,000 international students in Ontario, Toronto has emerged as the largest centre of foreign students in Canada. Last year’s 1st Toronto International Students Festival 2012 had over 1,500 people attend at Nathan Philips Square. At this year’s festival close to 3,000 international students, their families and friends, civic leaders, senior officials and staff of the partner universities and colleges and representatives of some top countries, which are the source of most of Toronto’s international students, will be attending. The Festival will feature speeches, cultural performances, award presentations, arts display, agency display booths and prizes. Event will be a prime networking spot for students from different countries, universities and colleges will find networking and integration opportunities among themselves and with business and community groups, employers, government and foreign government representatives. One the main events at this year’s festival: Eight students from Jamaica, Russia, India, United States, China, Ukraine and Mexico will receive Toronto Excellence Awards in the categories of community services, entrepreneurship, Academic excellence, sports, arts & culture, and student services. v To promote Toronto, Ontario and Canada as the global educational destinations. With foreign currency getting expensive, universities offering twinning programmes are seeing a surge in student enrolment. In 1994, Manipal University’s International Centre For Applied Sciences (ICAS) was built to accommodate about 200 students; only six students had signed up then. For long, the centre saw a steady rise in students and about 150-odd candidates joined last year. “I feel we will have around 250 students by the end of this year’s admission season,” says ICAS director G M J Bhat. At the other end, she adds, universities benefit from the close collaboration of faculty members which can also result in productive joint research projects. A study conducted by the Association of Indian Universities (AIU) revealed an upswing in the number of foreign education providers in India, from 144 in 2000 to 631 in 2010. Of these, 49 are operating under twinning arrangements, with MBA and hotel management being the most popular courses. The new Associate Membership Category and simplified, inclusive & budget-friendly CARE Process will allow members to network with each other and showcase themselves and their institutions in this vibrant and burgeoning education corridor by highlighting recent developments & new programs, engaging in dialogue on emerging opportunities, stimulating thought and discussing new initiatives and ideas in our monthly newsletter and live news portal ‘Disha’ which is read by over 19,000 academics and thought leaders from both countries. CIEC’s highly penetrative and potent network reaches academic champions from both countries, high level government representatives and policy makers, besides Colleges & Universities. 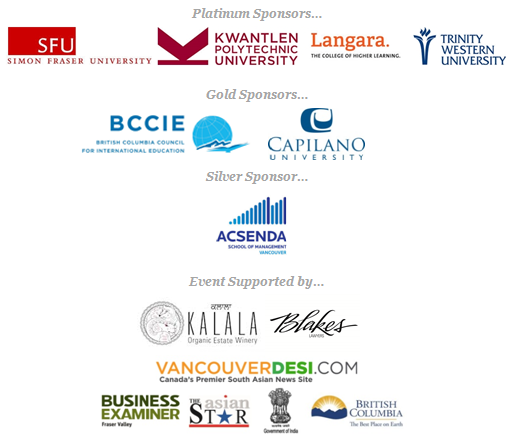 Registration is now open for our highly successful “Canada-India: A Synergy in Education” event, held since 2007. The Canada India Education Council (CIEC) is proud to host Synergy 2013 on Oct 3 & 4 at the Hilton Garden Inn near the Toronto Airport. This year’s event will highlight education activities as well as provide networking opportunities for institutions and organizations interested in operating in either or both countries. 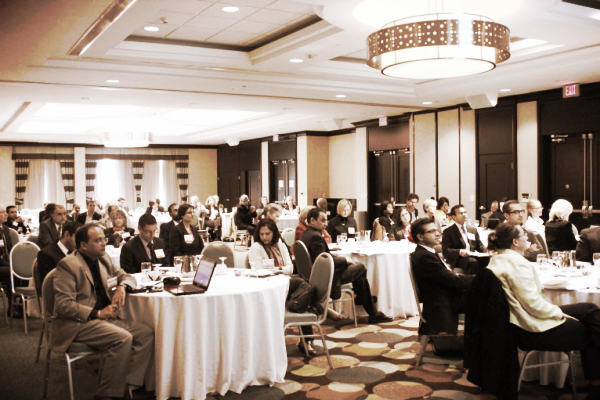 With a focus on key academic areas of co-operation and on partnerships, Synergy 2013 will provide updates from India regarding the entry for foreign education providers (Bill 57) leading to many possible outcomes for Canadian education providers. Synergy 2013 will serve as a great way to hear about both governments’ programs and policies in education, which have been recognized as a signature priority. An interesting session will be conducted by the National Association of Career Colleges (NACC) who will discuss impending legislation and how it could transform ‘Internationalization’ efforts for private institutions. 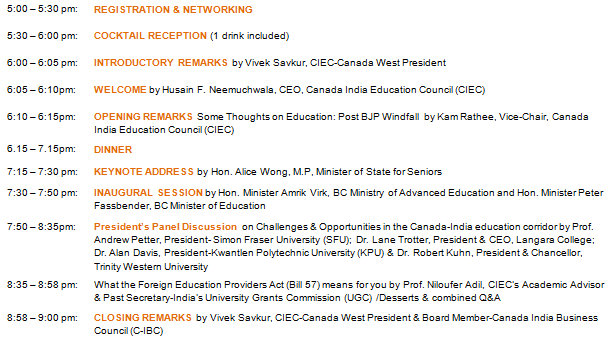 Synergy 2013 will also feature a round table discussion on the intersection of immigration & education in the Canada-India corridor and feature closing remarks by Hon. Bal Gosal, Minister of State (Sport) and a reception by the co-chairs of the Canada-India Parliamentary Association. Updates from Shastri Indo-Canadian Institute and the recently founded IC-IMPACT (announced by PM Stephen Harper in Nov 2012) will also be present and discuss opportunities for collaboration. Join over a hundred academic experts from both countries as they discuss recent developments and hear illustrious speakers stimulate thought and demonstrate the opportunities of this dynamic and burgeoning education corridor. For a detailed Agenda, click here. To Register, click here. The seating capacity at Synergy 2013 is only 120 and registration is once again on a first come basis. CIEC has negotiated a special rate for delegates staying at the hotel, which will also provide complimentary airport transfers. To take advantage of the discounted hotel rate, you must reserve your room by August 31st by clicking here. We look forward to seeing you at this year’s landmark event and in the meanwhile, have yourself a great summer! Registrations are now open for our highly successful “Canada-India: A Synergy in Education” event, held since 2007. 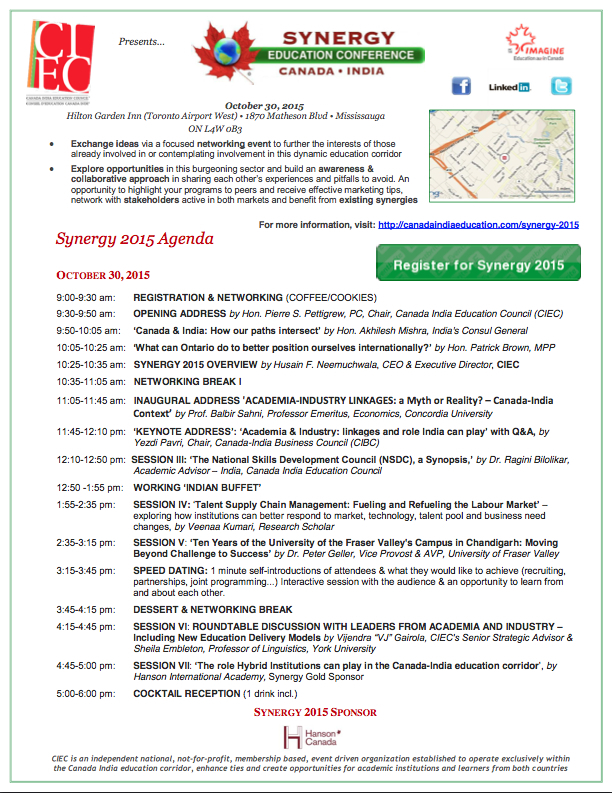 The Canada India Education Council (CIEC) is proud to host Synergy 2013 on Oct 3 & 4 at the Hilton Garden Inn near Toronto Airport. Updates from Shastri Indo-Canadian Institute and we are particularly delighted that the recently founded IC-IMPACT (announced by PM Stephen Harper in Nov 2012) will also be present and discuss opportunities for collaboration. Join hundreds of academic experts from both countries as they discuss recent developments and hear illustrious speakers stimulate thought and demonstrate the opportunities of this dynamic and burgeoning education corridor. 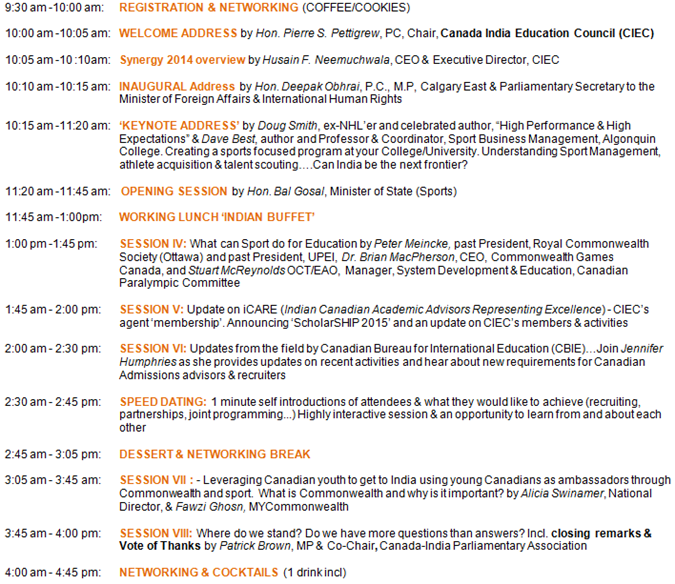 For a detailed Agenda, please visit: http://canadaindiaeducation.com/synergy-2013/ To Register, click here. The seating capacity at Synergy 2013 is only 120 and registration is once again on a first come basis. CIEC has negotiated a special rate for delegates staying at the hotel, which will also provide complimentary airport transfers. To take advantage of the discounted hotel rate, you must reserve your room by August 31st by clicking here. For delegates arriving from India, CIEC is pleased to provide a 1 night FREE stay at the Hilton Garden Inn. CIEC is a membership founded, not for profit, bi-national, independent, event-driven organization established to operate exclusively in the ‘Canada India education corridor’, enhance ties and create opportunities for academic institutions and learners from both countries. Academic relations between Canada and India are at an all time high and yet education linkages remain well below potential. CIEC was founded by bringing together 15 academic & non-academic organizations in Canada and has since gradually evolved into a valuable bridge between Canada & India. It is now positioned as the “go to” organization for Canada-India academic relations. CIEC is one of only a few organizations offering critical ‘on the ground’ presence in both countries and helps Institutions position themselves advantageously in an increasingly competitive environment. CIEC combines corporate governance with the benefits of a public-private partnership balanced with an entrepreneurial methodology to remain independent and yet be financially sustainable. CIEC has invested countless hours and resources in paving the way for academics, organizations, governments and other stakeholders to work with each other and has helped lay the foundation for smooth academic relationships and exchanges. We are proud of our accomplishments in this short span but also realize that we have only just begun to scratch the surface. Besides planning delegations, organizing missions (recruiting & otherwise), training seminars, facilitating academic exchanges and hosting our flagship annual ‘Synergy’ Conference for several years, there remains much more to do and many more opportunities to be seized. As CIEC opens its Membership to Institutions across India and Canada, we invite Colleges, Universities and interested Corporations to join us as we enhance ties and create opportunities for academic institutions and learners from both countries. Members will have an opportunity to network with each other and showcase themselves and their institutions in this vibrant and burgeoning education corridor. CIEC Membership will also serve as a unique way to profile your Institutions programs, commitments and initiatives in this vibrant ‘corridor’ and with thought provoking discussions led by experts from both countries featured in our monthly newsletter and live news portal ‘Disha‘ which is read by over 19,000 academics and thought leaders from both countries. Members can highlight recent developments, new programs, dialogue on emerging opportunities, stimulate thought and discuss new initiatives and ideas. CIEC’s highly penetrative and potent network reaches academic champions from both countries, high level government representatives and policy makers, besides Colleges & Universities. CIEC is a non-profit, bi-national, bi-partisan, independent, event-driven, membership-based organization established to operate exclusively in the ‘Canada India education corridor’, enhance ties and create opportunities for academic institutions and learners from both countries. To become an Associate Member and be counted as a leader and make yourself known in this dynamic and growing sector, click here to register and active your 1-year FREE listing online. We look forward to working with you. Visit ‘Disha,’ a ‘clearing house’ of information & updates pertaining to the Canada-India education corridor distributed to our database of 19 000 key education stakeholders, and subscribe to receive monthly editions. Canada India Education Council (CIEC) is pleased to announce that this year’s 7th Annual ‘Synergy 2013’ event is just around the corner and will at once feature major stakeholders such as AUCC, DFAIT, Ontario Maharashtra Goa (OMG), Shastri Institute (SICI) and academic experts from India accompanied by 5 Canadian MP’s and key thought leaders from both countries. We are particularly delighted that the recently founded IC-IMPACT which was announced by PM Stephen Harper in Nov 2012 will also be present and discuss opportunities for others to get involved in. Another interesting session will be conducted by representatives of the National Association of Career Colleges (NACC) who will discuss impending legislation and how it could transform ‘Internationalization’ efforts for private institutions. Synergy 2013 will also feature a round table discussion on the intersection of immigration & education in the Canada-India corridor and feature closing remarks by Hon. 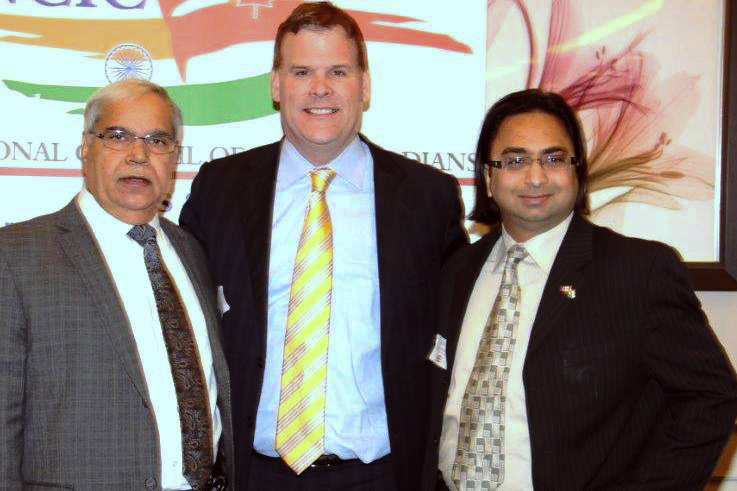 Bal Gosal, Minister of State (Sport) and a reception by the co-chairs of the Canada-India Parliamentary Association. On Oct 3 & 4, join academic experts from both countries as they discuss recent developments and hear illustrious speakers stimulate thought and showcase opportunities in this dynamic and burgeoning education corridor. The seating capacity is only 120 and registration is once again on a first come basis. CIEC has negotiated a special rate for delegates staying at the hotel, which will also provide complimentary airport transfers. 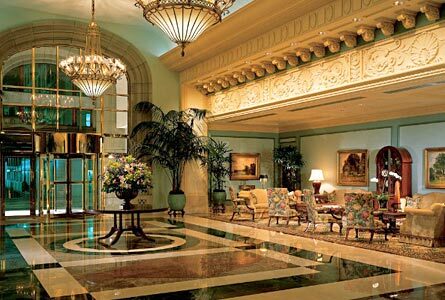 To take advantage of the discounted hotel rate, reserve your room by clicking here. For delegates arriving from India, CIEC is pleased to provide 1 night FREE stay at the Hilton Garden Inn in Toronto. Explore opportunities in this burgeoning sector and build an awareness & collaborative approach in sharing each other’s experiences and pitfalls to avoid. An opportunity to highlight your programs to peers and receive effective marketing tips, network with stakeholders active in both markets and benefit from existing connections. For those who can’t make it, CIEC’s media team will be tweeting and updating you in real time via Twitter, Facebook, and LinkedIn. You may find a detailed Agenda here. We look forward to seeing you at Synergy 2013. On Thursday, April 18, College of the Rockies celebrated being chosen as the Number One destination for International Students in Canada and Number Two in the world, based on overall ratings by students. The survey, the Student Barometer, is the largest of its kind and conducted annually by the International Graduate Insight Group (i-graduate). Students from 193 educational institutions from 15 countries were asked to rate their schools covering four categories: arrival experience, support, living, and learning. This included 25 from Canada and, among them, College of the Rockies earned top honours. Shastri Indo-Canadian Institute’s upcoming President Shanthi Johnson will be speaking at this year’s event accompanied by 5 Canadian Members of Parliament. CIEC is still accepting proposals and we would love to hear from those interested in joining this esteemed line-up of speakers. CIEC will be offering a 1-night free stay at the Hilton Garden Inn to delegates traveling from India as well as a special rate and complimentary airport pick up for ALL Synergy participants. Click here to learn more, register, or submit a proposal. CIEC welcomes Gaurav Verma, CIEC’s Project Coordinator, to the Executive Team. 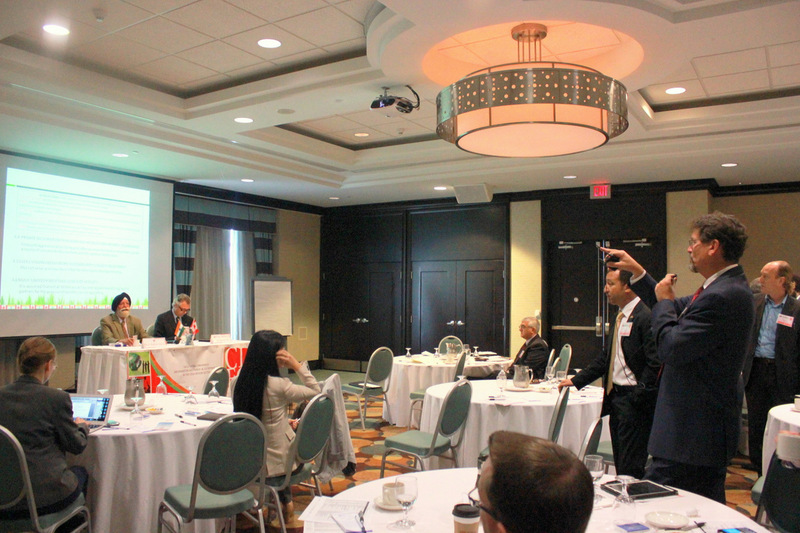 Gaurav is uniquely qualified to oversee CARE – CIEC’s Agent Membership category – contributing his vast experience of working with international students and in the Indian Agent market as well as valuable, active, working relations with over 40 ACCC colleges in Canada. Accredited to him is a unique method of working with the Sub Associate Network for the Indian Market keeping a student-centric approach to expand, generate, and maximize results. His knowledge of Education Management, International Student Recruitment, and Marketing has proven a valuable contribution to CIEC and will have a lasting effect on serving and assisting Canadian and Indian education stakeholders. The much-lauded CARE Initiative is designed to bring transparency to the agent sector in India by promoting the CARE Standards. CARE is supported by CIEC’s member institutions, including Canadian Colleges & Universities, and is poised to soon become the benchmark in establishing standards for counselors and agents promoting Canadian education in India. CARE Recognition will be granted by an impartial and knowledgeable Membership Committee, comprised of academic experts representing 3 major Canadian Colleges as well as CIEC staff. CARE serves as a cost-effective way for education agents to gain exposure, establish their credentials, and distinguish themselves in the exciting Canada-India education corridor. Agents wishing to strategically position themselves in an increasingly fierce and competitive international environment are invited to become an CARE Recognized Member of the Canada India Education Council. For a full list of CARE benefits, click here. You can contact Gaurav Verma at iCARE@CanadaIndiaEducation.com to request an Application Form. Academic relations between Canada and India are at an all time high and yet education linkages remain well below potential. This is despite the trailblazing work being done against the backdrop of cordial relations between our two countries; the size and growing importance of the Indian ‘Diaspora’ in Canada and significant efforts devoted in recent years to strengthening academic linkages in this exciting sector. 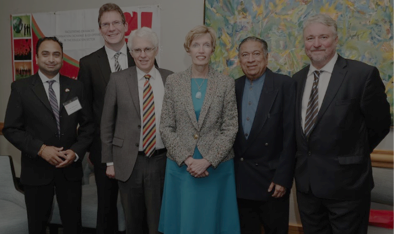 After observing India’s keen interest in reaching out ‘Internationally’ and the capacity gap ‘widening’, Canada India Education Council (CIEC) was founded in 2010 by bringing together 15 academic & non-academic organizations in Canada. Since our creation, CIEC has gradually evolved into a valuable bridge between Canada & India and is poised to soon become the “go to” organization for Canada-India academic relations. CIEC is one of only a few organizations offering critical ‘on the ground’ presence in both countries and helps Institutions position themselves advantageously in an increasingly competitive environment. CIEC combines corporate governance with the benefits of a public-private partnership balanced with an entrepreneurial methodology to remain independent and yet be financially sustainable. CIEC has invested countless hours and resources in paving the way for academics, organizations, governments and other stakeholders to collectively work with each other and have helped lay the foundation for smooth academic relationships and exchanges. We are proud of our accomplishments in this short span but also realize that we have only just begun to scratch the surface. Besides planning delegations, organizing missions (recruiting & otherwise) and hosting our flagship annual ‘Synergy’ Conference for over 6 years, there remains much more to do and many opportunities to be seized. As CIEC opens its Membership ranks to Institutions across Canada and India we invite select Colleges | Universities and interested Corporations to join us as we enhance ties and create opportunities for academic institutions and learners from both countries. Members will have an opportunity to network with each other and showcase themselves and their institutions in this vibrant and burgeoning Canada-India education corridor. Your CIEC Membership will also serve as yet another way to profile your Institutions programs, commitments and initiatives in this vibrant ‘corridor’ and with thought provoking discussions led by experts from both countries via our weekly newsletter (reaching over 19,000 academics and thought leaders from both countries), members can highlight recent developments, new programs, dialogue on emerging opportunities, stimulate thought and discuss new initiatives and ideas. CIEC’s highly penetrative and potent network reaches academic champions from both countries, high level government representatives and policy makers besides key Canadian & Indian Colleges and Universities. In keeping with our non profit designation & mindful of shrinking budgets, CIEC’s ‘Membership fee’ is a nominal $100/month which we hope will allow for broader participation and create a greater value proposition for Members. CIEC invites you to join us as we work together to create a win-win situation and by building on past successes, we look forward to a promising future. The budget friendly Membership fee of $100/month will not only demonstrate your interest in reaching out to key academic leaders from other institutions but also afford access to exclusive ‘Member only’ events and enable hosting visiting delegations on your campus. CIEC is a non profit, bi-national, bi-partisan, independent, event-driven, membership-based organization established to operate exclusively in the ‘Canada India education corridor’, enhance ties and create opportunities for academic institutions and learners from both countries. To become a Member and be counted as a leader and be visible in this dynamic and growing sector, click here to get started. We look forward to working with you. Academic Members can partake in our ‘Virtual Campus Tours‘ (exclusive to members) by submitting 5 – 10 images of their academic institution, more information below. CIEC invites academic, agent and corporate members to submit up to three activities or events per month (recruiting trips/travelling delegates, new programs/start dates, job postings) for free as an exclusive membership benefit. Contributions will be posted in the much-lauded, monthly ‘Disha’ (Direction) e-newsletter reaching the CIEC database of 19 000 education stakeholders. CIEC now also promotes member and non-member events free-of-charge on the CIEC website, the live ‘Disha’ blog, and the ‘Disha’ newsletter. Interested institutions are asked to send a logo, introductory paragraph and website link to include in the ‘Partner Events’ section of ‘Disha.’ Please send your postings to media@CanadaIndiaEducation.com. Interested institutions can send their photos and corresponding captions (if applicable) to media@CanadaIndiaEducation.com with ‘Virtual Tours’ in the subject line. 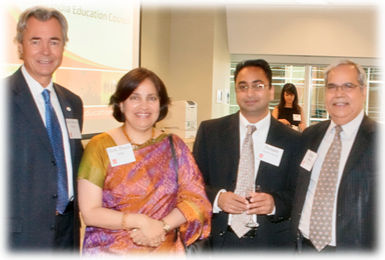 Welcome to the Canada India Education Council. Our objective is to facilitate conversation & co-operation in the Canada-India education corridor. CIEC promotes education ties between Canada and India through recruiting opportunities, partnerships, joint ventures & programming, and organizing trade delegations, to name a few. CIEC advises and aids institutions wishing to conduct academic linkages or exchange programs and connects potential students with reputable sources of information about the merits of an education or exchange program in either country. The council serves as a forum for exchange of information and views between education providers, academics and associates from both countries. CIEC aims to create a ‘clearing house’ of information and boasts a highly potent and interactive database that can be utilized to benefit members in both countries and update users of key events. CIEC actively uses social networking tools to foster awareness and the development of an ‘academic community’ for sharing of information between academia, students, agents, high school counsellors and other like-minded groups to ‘connect’ with each other. CIEC delivers value and engages member Institutions through shared sector updates and potential opportunities, actively soliciting feedback, and offering tailored solutions to suit each member’s goals and needs. 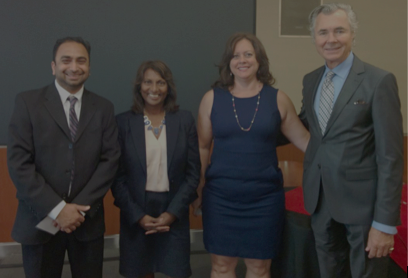 CIEC’s newest initiative is the much-lauded Agent Membership category: CARE – Indian Canadian Academic Advisors Representing Excellence. CARE promotes transparency and ethical business practice in the international student recruitment market. It is designed to act as a means for agencies that recruit students to Canadian accredited colleges, universities and other educational institutions to assess their services and ultimately fulfill their goal of providing a level of service that is at par with the expectations of students and Canadian academic institutions. Agents are evaluated on their compliance with ‘CARE Standards’ through rigorous management and staff self-assessments, reference checks, and site visits. The grueling CARE Process and mandatory training Increases agent awareness about the types of courses and institutions as well as different education options in Canada. CARE – Recognized Agent Members shall be education agencies that have successfully undergone the CARE Process and have been approved for membership by the Membership Committee. They have demonstrated their dedication to providing students and academic institutions ethical, quality education consulting services. CARE offers regulation for the burgeoning education agency / consulting sector in India, meets the need for a consolidated database of ‘Agents & Consultants,’ and Increases accountability and responsibility of ‘Agents & Consultants’ towards the students and Institutions they represent. We look forward to your support and invite you to join our network of academic insiders & institutions, businesses, agents and students so that together we may succeed in this vibrant education corridor. 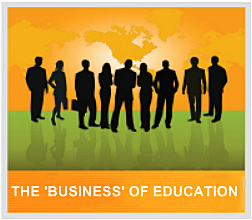 CIEC is an independent national, not-for-profit, membership based, event driven organisation established to operate exclusively within the burgeoning Canada-India education corridor. CARE agents enjoy many benefits. CIEC invites you to visit our website for a detailed overview of the CARE process and benefits. Membership fees range from $1500 to $2500 for a 3 year period and the approval process takes between 4 to 6 months. If you have any questions or comments, please direct them to info@CanadaIndiaEducation.com. We look forward to working with you in growing your brand while promoting ethical student recruitment in the burgeoning Canada-India education corridor. Speaking as Vice-­‐Chairman of the Canada-­‐India Education Council, I would mention the five points that need to be considered for promoting Canada as a destination for Indian students. On top of the list is the need to improve “Brand Canada” in India. Among the top four or five countries that attract most of Indian students, Canada has always been the weakest brand after the US, UK and Australia. Now since in the case of the UK, there are problems related to immigration and fees issues and in the case of Australia Indian students have security issues, I think Canada has a golden opportunity to market itself as an educational destination in India. Though the numbers of Indian students coming to Canada has increased over the last two to three years, it still has a long way to go. Secondly, fees for foreign students are very high in this country. In fact, Canada charges three times more fees from foreign students than local students for imparting the same education and handing out the same diplomas and degrees. In 2010, there were 218,000 foreign students in Canada of which 17,530 came from India – 4,640 as university students and 10,560 as post-­‐secondary students. Most of them come from Indian middle class families and find it difficult to meet their expenses. 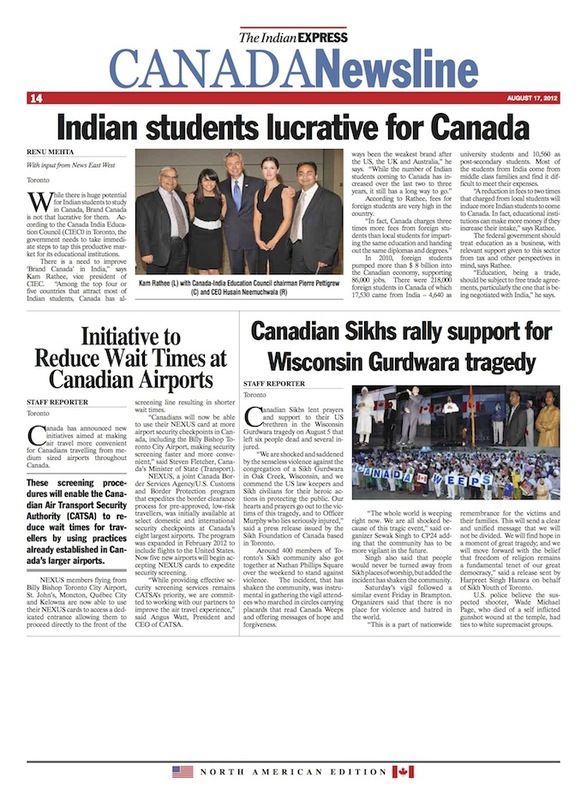 A reduction in fees to two times that charged from local students will induce more Indian students to come to Canada. In fact, educational institutions can make more money if they increase their intake. Thirdly, Canada’s federal government needs to play a more active role. In Canada, education is a provincial matter with no significant federal role in it. But foreign students pumped more than $ 8 billion into the Canadian economy in 2010 and supported 86,000 jobs. Despite this, for some strange reasons, education is still not seen as an economic activity – an export commodity and a business enterprise for which foreign students pay three times more than local students. The federal government needs to get involved with the provinces and treat education as a business, with relevant support given to this sector from tax and other perspectives in mind. Education, being a trade, should be subject to free trade agreements, particularly the one that is being negotiated with India. Fourthly, Canada needs to make education employment and profession oriented so that the fruits of it are clear to those seeking to come here. Canada is turning into a service economy and losing its place as a major manufacturing player. Foreign students coming to Canada are forced to leave as they cannot use their education for a career or employment here. Though this is changing on account of the two-­‐ year post graduation work visas being available, it is still tough to secure employment for foreign students notwithstanding the fact that they have obtained a Canadian degree or diploma. There needs to be a program under which the institution enrolling students from India should have an obligation to assist them in getting meaningful employment on completion of their education. Thousands of Indian students applying to Canadian universities may no longer run the risk of a Tri-Valley University (TVU) repeat under a unique plan aimed at students concerned after recent instances of fraud abroad. The Canada India Education Council (CIEC), which coordinates educational ties between the two countries, plans to launch CARE, an agent certification process, this July ahead of the Fall 2011 academic session. Around 12,000 Indian students are currently studying in Canada. Senior Canadian government officials have told HT that the Federal government is backing the initiative that it hopes will help Canada emerge an alternate destination for Indian students seeking to study abroad. “Students in India are worried about studying abroad after the TVU scam and the recent instances of fraud and race attacks in Australia. We believe that if we pitch Canada appropriately, we can show Indian students that our country is a very attractive alternative,” a senior Canadian official said. The CARE process will allow Indian students keen on studying in Canada to ensure that education agents are certified, CIEC Executive Director Husain F Neemuchwala said. The CIEC-modeled on the lines of the United States India Education Foundation (USIEF)- is particularly critical for Indo-Canadian ties because Canada does not have a federal education department. Education is managed by each Province. The CIEC is an NGO, but is supported by the Canadian Government. But Canada is keenly pushing its education as a major source of revenue- to be earned from foreign students. India at present falls behind China, the US, Mexico and a handful of other countries in the number of students it sends to Canada. The Canada India Education Council (CIEC) has launched a certification programme that recognises quality and ethical practice among education agents involved in Canada-India exchange. Indian Canadian Advisors Representing Excellence (CARE) is the only bespoke certification system of its kind and aims to establish rules on agent practice; increase accountability; and make it easier for Indian agents to find Canadian universities and colleges appropriate for their students through its membership database. The certification process, aimed to certify agencies working with Canadian institutions, places high emphasis on transparency, requires agents to be upfront about hidden fees and consistent in how they represent themselves to students. Agents are reported to have reacted positively to the system since launch, with 60 already hoping for certification once pilot tests are finished. However, Neemuchwala emphasises that CIEC is not aiming for rapid growth. “Quality over quantity is the premise on which CARE was created. 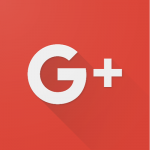 If not colleges and universities can Google [search] and look up agents themselves. The whole idea is to create a smaller number of validated and certified agents that we can stand behind,” he said. CARE also promises institutions a streamlined recruitment process, greater exposure to the best of the Indian agency market, and information on student trends. Neemuchwala said, “As CARE gets more momentum, things will improve not just for specific colleges and university members but the industry in general. There are people who don’t like to use agents but this might change their minds. The certification process takes between four to six months to complete and certification lasts two years. In that time agents can use the CARE promotional materials, will be listed on the CIEC website, and will gain greater access to CIEC member universities and colleges among other benefits. Founded in 2010, CIEC is an event-driven, membership organisation. CARE is open to CIEC agent members at no cost and for a fee to non-members. The extent of non-member access to the comprehensive agent listings is yet to be determined.